First WWW server located at CERN with its original sticker that says: "This machine is a server. DO NOT POWER IT DOWN!!" The use of the word server in computing comes from queueing theory, where it dates to the mid 20th century, being notably used in Kendall (1953) (along with "service"), the paper that introduced Kendall's notation. In earlier papers, such as the Erlang (1909), more concrete terms such as "[telephone] operators" are used. In computing, "server" dates at least to RFC 5 (1969), one of the earliest documents describing ARPANET (the predecessor of Internet), and is contrasted with "user", distinguishing two types of host: "server-host" and "user-host". The use of "serving" also dates to early documents, such as RFC 4, contrasting "serving-host" with "using-host". SERVER n. A kind of DAEMON which performs a service for the requester, which often runs on a computer other than the one on which the server runs. Strictly speaking, the term server refers to a computer program or process (running program). Through metonymy, it refers to a device used for (or a device dedicated to) running one or several server programs. On a network, such a device is called a host. In addition to server, the words serve and service (as noun and as verb) are frequently used, though servicer and servant are not. [a] The word service (noun) may refer to either the abstract form of functionality, e.g. Web service. Alternatively, it may refer to a computer program that turns a computer into a server, e.g. Windows service. Originally used as "servers serve users" (and "users use servers"), in the sense of "obey", today one often says that "servers serve data", in the same sense as "give". For instance, web servers "serve [up] web pages to users" or "service their requests". The server is part of the client–server model; in this model, a server serves data for clients. The nature of communication between a client and server is request and response. This is in contrast with peer-to-peer model in which the relationship is on-demand reciprocation. In principle, any computerized process that can be used or called by another process (particularly remotely, particularly to share a resource) is a server, and the calling process or processes is a client. Thus any general purpose computer connected to a network can host servers. For example, if files on a device are shared by some process, that process is a file server. Similarly, web server software can run on any capable computer, and so a laptop or a personal computer can host a web server. While request–response is the most common client–server design, there are others, such as the publish–subscribe pattern. In the publish–subscribe pattern, clients register with a pub–sub server, subscribing to specified types of messages; this initial registration may be done by request–response. Thereafter, the pub–sub server forwards matching messages to the clients without any further requests: the server pushes messages to the client, rather than the client pulling messages from the server as in request–response. The purpose of a server is to share data as well as to share resources and distribute work. A server computer can serve its own computer programs as well; depending on the scenario, this could be part of a quid pro quo transaction, or simply a technical possibility. The following table shows several scenarios in which a server is used. Computing server Shares vast amounts of computing resources, especially CPU and random-access memory, over a network. Any computer program that needs more CPU power and RAM than a personal computer can probably afford. The client must be a networked computer; otherwise, there would be no client–server model. Sound server Enables computer programs to play and record sound, individually or cooperatively Computer programs of the same computer and network clients. Almost the entire structure of the Internet is based upon a client–server model. High-level root nameservers, DNS, and routers direct the traffic on the internet. There are millions of servers connected to the Internet, running continuously throughout the world and virtually every action taken by an ordinary Internet user requires one or more interactions with one or more server. There are exceptions that do not use dedicated servers; for example peer-to-peer file sharing, some implementations of telephony (e.g. pre-Microsoft Skype). Hardware requirement for servers vary widely, depending on the server's purpose and its software. Since servers are usually accessed over a network, many run unattended without a computer monitor or input device, audio hardware and USB interfaces. Many servers do not have a graphical user interface (GUI). They are configured and managed remotely. Remote management can be conducted via various methods including Microsoft Management Console (MMC), PowerShell, SSH and browser-based out-of-band management systems such as Dell's iDRAC or HP's iLo. Large traditional single servers would need to be run for long periods without interruption. Availability would have to be very high, making hardware reliability and durability extremely important. Mission-critical enterprise servers would be very fault tolerant and use specialized hardware with low failure rates in order to maximize uptime. Uninterruptible power supplies might be incorporated to guard against power failure. Servers typically include hardware redundancy such as dual power supplies, RAID disk systems, and ECC memory, along with extensive pre-boot memory testing and verification. Critical components might be hot swappable, allowing technicians to replace them on the running server without shutting it down, and to guard against overheating, servers might have more powerful fans or use water cooling. They will often be able to be configured, powered up and down or rebooted remotely, using out-of-band management, typically based on IPMI. Server casings are usually flat and wide, and designed to be rack-mounted. These types of servers are often housed in dedicated data centers. These will normally have very stable power and Internet and increased security. Noise is also less of a concern, but power consumption and heat output can be a serious issue. Server rooms are equipped with air conditioning devices. 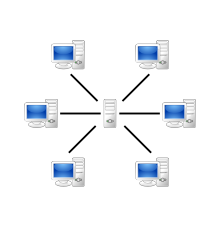 A server farm or server cluster is a collection of computer servers maintained by an organization to supply server functionality far beyond the capability of a single device. Modern data centers are now often built of very large clusters of much simpler servers, and there is a collaborative effort, Open Compute Project around this concept. A class of small specialist servers called network appliances are generally at the low end of the scale, often being smaller than common desktop computers. 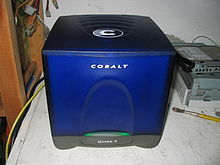 Sun's Cobalt Qube 3; a computer server appliance (2002); running Cobalt Linux (a customized version of Red Hat Linux, using the 2.2 Linux kernel), complete with the Apache web server. On the Internet the dominant operating systems among servers are UNIX-like open-source distributions, such as those based on Linux and FreeBSD, with Windows Server also having a very significant share. Proprietary operating systems such as z/OS and macOS Server are also deployed, but in much smaller numbers. Tight system security, with advanced user, resource, data, and memory protection. In practice, today many desktop and server operating systems share similar code bases, differing mostly in configuration. In 2010, data centers (servers, cooling, and other electrical infrastructure) were responsible for 1.1-1.5% of electrical energy consumption worldwide and 1.7-2.2% in the United States. One estimate is that total energy consumption for information and communications technology saves more than 5 times its carbon footprint in the rest of the economy by increasing efficiency. ^ A CORBA servant is a server-side object to which method calls from remote method invocation are forwarded, but this is an uncommon usage. ^ Windows Server Administration Fundamentals. Microsoft Official Academic Course. 111 River Street, Hoboken, NJ 07030: John Wiley & Sons. 2011. pp. 2–3. ISBN 978-0-470-90182-3. ^ Comer, Douglas E.; Stevens, David L. (1993). Vol III: Client-Server Programming and Applications. Internetworking with TCP/IP. Department of Computer Sciences, Purdue University, West Lafayette, IN 479: Prentice Hall. pp. 11d. ISBN 978-0-13-474222-9. ^ Rulifson, Jeff (June 1969). DEL. IETF. doi:10.17487/RFC0005. RFC 5. Retrieved 30 November 2013. ^ IT Explained. "Server - Definition and Details". www.paessler.com. ^ "Web Servers". IT Business Edge. Retrieved July 31, 2013. ^ "Google uncloaks once-secret server". CNET. CBS Interactive. Retrieved 2017-01-30. ^ "Usage statistics and market share of Linux for websites". Retrieved 18 Jan 2013. ^ "Server Oriented Operating System". Retrieved 2010-05-25. ^ Markoff, John (31 Jul 2011). "Data Centers Using Less Power Than Forecast, Report Says". NY Times. Retrieved 18 Jan 2013. ^ "SMART 2020: Enabling the low carbon economy in the information age" (PDF). The Climate Group. 6 Oct 2008. Archived from the original (PDF) on 22 November 2010. Retrieved 18 Jan 2013. 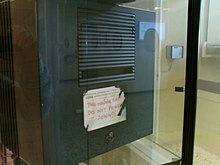 Wikimedia Commons has media related to Servers. Erlang, Agner Krarup (1909). "The theory of probabilities and telephone conversations" (PDF). NYT Tidsskrift for Matematik B. 20: 33–39. Archived from the original (PDF) on 2011-10-01. Kendall, D. G. (1953). "Stochastic Processes Occurring in the Theory of Queues and their Analysis by the Method of the Imbedded Markov Chain". The Annals of Mathematical Statistics. 24 (3): 338–354. doi:10.1214/aoms/1177728975. JSTOR 2236285. This page was last edited on 17 April 2019, at 10:06 (UTC).